A suicide bombing killed at least 13 people and wounded 71 others Friday at a hotel near Islamabad's Red Mosque, after religious students occupied the mosque and demanded the return of its pro-Taliban cleric. The explosion occurred soon after police fired tear gas to disperse hundreds of protesters who for several hours took control of the mosque which the government reopened to the public Friday — two weeks after a bloody army siege dislodged militants. There was no claim of responsibility for the bombing, but Islamic militants will be suspected as behind what is the latest in a string of attacks to hit Pakistan since the army operation at the Lal Masjid, or Red Mosque, in the Pakistani capital left at least 102 people dead. Amir Mehmood, a witness, said the blast went off inside the Muzaffar Hotel, located in a crowded market area about a half-kilometer (quarter mile) from the mosque. He said he saw blood, body parts, and shreds of the Punjab police uniform inside the hotel. 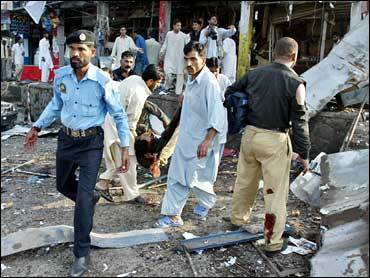 Neighboring shops and food stalls were also hit by the blast. Explosive experts collected parts from the torso of a man's mutilated body that they suspected was the bomber's, a senior police officer said on condition of anonymity because he was unauthorized to make media comments. "We strongly believe that the head is of the suicide bomber," he said. Earlier Friday, protesters had occupied the mosque after forcing the retreat of a government-appointed cleric who was assigned to lead Friday prayers there. Police largely stood by as the demonstrators clambered onto ladders and the roof, and began splashing red paint onto the walls to restore the mosque's namesake color after a government restoration left it pale yellow. They also rose a black flag with two crossed swords — meant to symbolize jihad, or holy war. But street battles erupted when religious students and other supporters of the mosque's pro-Taliban former clerics threw stones at dozens of police in riot gear on a road outside the mosque. After protesters disregarded police calls to disperse peacefully, police fired the tear gas, and scattered the crowd which mostly fled back inside the mosque compound. The protesters demanded the return of the mosque's former chief cleric, Abdul Aziz — who is currently in government detention — and shouted slogans against President Gen. Pervez Musharraf. Later a cleric from a seminary associated with the mosque led the prayers. "Musharraf is a dog! He is worse than a dog! He should resign!" students shouted. Some lingered over the ruins of a neighboring girls' seminary that was demolished by authorities this week. Militants had used the seminary to resist government forces involved in the weeklong siege that ended July 12. The crowd also shouted support for the mosque's former deputy cleric, Abdul Rashid Ghazi, who led the siege until he was shot dead by security forces after refusing to surrender. He had spearheaded a vigilante, Islamic anti-vice campaign that had challenged the government's writ in the city. "Ghazi your blood will lead to a revolution," the protesters chanted. Over mosque loudspeakers, protesters were vowing to "take revenge for the blood of martyrs" although some other speakers urged calm after the unrest broke out. Friday's reopening was meant to help cool anger over the siege, which triggered a flare-up in militant attacks on security forces across Pakistan. Public skepticism still runs high over the government's accounting of how many people died. Earlier, in a speech at the main entrance of the mosque, Liaqat Baloch, deputy leader of a coalition of hard-line religious parties, the Mutahida Majlis-e-Amal (MMA), condemned Musharraf as a "killer." He declared there would be an Islamic revolution in Pakistan. Pakistan's Geo television showed scenes of pandemonium inside the mosque, with dozens of young men in traditional Islamic clothing and prayer caps shouting angrily and punching the air with their hands. Maulana Ashfaq Ahmed, a senior cleric from another mosque in the city who was assigned by the government to lead Friday's prayers, was quickly escorted from the mosque, as protesters waved angry gestures at him. Despite questions over Musharraf's will, and ability, to tackle the apparent extremist revival gripping his country, the military ruler reiterated Friday his insistence that U.S. troops would not be allowed on Pakistani soil to help in the fight. "It is very clear that here on Pakistani territory only Pakistani troops will operate. Nobody should have any doubt," Musharraf told journalists before leaving to visit Saudi Arabia and the United Arab Emirates, reports CBS News' Farhan Bokhari. "It is the arrangement (with the U.S.), and we are capable of defending our area. We don't need any other force to help or assist us", Musharraf added. CBS News State Department reporter Charlie Wolfson reports that the Bush administration is trying to organize a three-way meeting sometime in September, between Musharraf, his Afghan counterpart Hamid Karzai, and the U.S. president, according to a State Department official. The official, who spoke to CBS News on condition of anonymity, said both Musharraf and Karzai were due to be in New York in September for meetings at the United Nations, and that would provide a good opportunity for a side trip to Washington. Already under intense pressure at home for having a close relationship with the White House, it would be "better for Musharraf" to have the UN meetings as a pretext for being in the United States, the official said. President Bush said Saturday he was troubled by reports from the combined U.S. intelligence community that al Qaeda was regrouping and gaining strength in Pakistan's Northwest Frontier Province. Pakistani officials have since speculated that U.S. counterterror operations of some kind could be launched in the tribal region, flaunting the sovereignty of a crucial White House ally. A senior Pakistani lawyer, who spoke to CBS News on condition of anonymity, said any U.S. incursion into Pakistani territory would likely break the relationship between Washington and Islamabad — and it may not be successful in netting the al Qaeda leaders thought to be hiding in the northwest region. "Iraq is such an obvious case of U.S. intelligence failure. The U.S. went in on the pretext of finding weapons of mass destruction which have never been found. What is the evidence that U.S. intelligence on Pakistan is accurate?" he asked. A senior Western diplomat in Islamabad, who also spoke to CBS News on the condition that he not be named, said the current trend in U.S.-Pakistan relations puts both countries in a difficult situation. "The U.S. is so deeply unpopular in the Islamic world that it needs allies, and Gen. Musharraf is among its few reliable allies." "If there is a U.S. incursion in Pakistan, there is bound to be immense public reaction. In the fallout, Musharraf may be ousted. But, since the Americans have pointed the finger at Pakistan, any high profile terrorist attack (in the U.S.) will immediately be linked to Pakistan. It's quite a mess," the diplomat added. The immediate crisis for Musharraf, however, is how to deal with the element of his population that is calling for a revolution, to oust him and impose fundamentalist Islamic law. Public skepticism still runs high over the government's accounting of how many people died in the mosque siege, with many still claiming a large number of children and religious students were among the dead. The government says the overwhelming majority were militants. Mohammed Jesanjir, a 14-year-old student from a religious school elsewhere in Islamabad that is connected to the mosque, said Musharraf "will be humiliated like he humiliated the Quran," Islam's holy book, by ordering the mosque raid. "God willing, we will take revenge," he said. Militants holed up in the mosque compound for a week before government troops launched their assault on July 10, leaving it pocked with bullet holes and damaged by explosions. At least 102 people were killed in the violence. Attacks by militants in northwestern Pakistan along the border with Afghanistan have surged since the siege, killing about 200 others in suicide bombings and clashes.